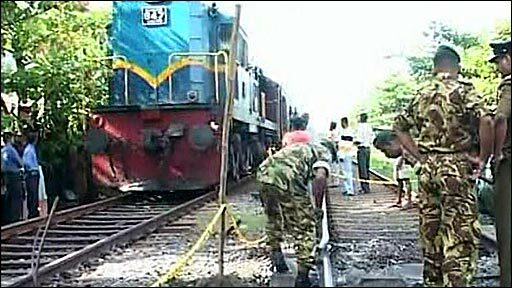 Army and police officers inspecting railway tracks at scene of blast. At least 24 people were injured when a packed commuter train in the Sri Lankan capital, Colombo, was hit by a bomb, the military says. The bomb exploded seconds after the last carriage of the train had passed by, according to the army website. The incident happened at 0710 local time as the train was passing between Wellawatte and Dehiwela districts. Last week the Tamil Tigers were blamed for a bomb attack at Dehiwela station that left at least eight dead. The injured from Wednesday's attack were taken to nearby hospitals. "The train was packed. There were about 1,500, passengers, mostly office workers travelling... to the city," the train's driver told the AFP news agency. Police said the bomb had been planted on another track parallel to the one the train was using. There have been a number of bomb attacks in Colombo recently blamed on the Tamil Tigers. In February, 11 people died in a suicide attack at Colombo's main train station. In northern Sri Lanka the military is carrying out an offensive aimed at crushing the rebels by the end of this year. The Tigers have fought for a generation for an independent state for the Tamil minority in the island's north and east. About 70,000 people have been killed since the civil war began in 1983.